Nerf Bars and running boards serve the same basic function of providing drivers and passengers easy access into and out of their vehicles. Nerf bars are typically pipe-like fixtures that attach to the side of your truck. In contrast, running boards are a more sleek option for a truck. They’re sometimes viewed as more refined and were originally included on many vintage cars, according to On All Cylinders. 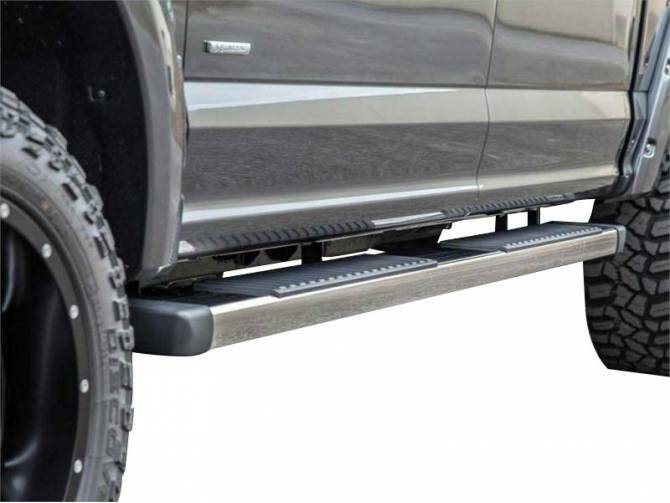 Running boards are positioned at the bottom of trucks or SUVs to provide a wider stepping surface. Choosing between nerf bars and running boards truly comes down to personal preference. Running boards and nerf bars serve the same basic function of providing drivers and passengers easy access into and out of their vehicles. Nerf bars are typically pipe-like fixtures that attach to the side of your truck. In contrast, running boards are a more sleek option for a truck. They’re sometimes viewed as more refined and were originally included on many vintage cars, according to On All Cylinders. Running boards are positioned at the bottom of trucks or SUVs to provide a wider stepping surface. Choosing between running boards or nerf bars truly comes down to personal preference. Ultimately, whether you opt for nerf bars and running boards, both accessories are used almost 100 percent of the time drivers and passengers hop into the cab of your vehicle so choosing the right option is important. Consider the cost, functionality, size and shape as well as the finish before committing to nerf bars or running boards. Generally, nerf bars are less expensive than running boards. They usually offer a smaller surface area than running boards, offering people less of a step into the truck. Nerf bars also have more industrial look to them. Running boards generally run the length of your truck while nerf bars do not. Having said this, nerf bars are still highly functional and some drivers prefer the tougher, rugged look for their trucks. Nerf Bars can hold up to 500 lbs, and running boards can generally support up to 600 lbs. The maximum weight for both accessories will vary by manufacturer. It will also depend on the type of material used to create each accessory, for example, steel versus aluminum. Both running boards and nerf bars prove to be especially helpful when reaching to strap items to the roof of your truck. They also provide the perfect step when washing your vehicle or when strapping ladders or other items in place. Because they’re typically round, nerf bars tend to be more slippery when they’re wet than running boards. Always use caution when standing on either truck accessory to prevent injuries. Another consideration is the size of the stepping surface (or the diameter) of the nerf bar or running board. According to 4 Wheel Online, running board width (and shape) is typically predetermined depending on the specific one you might choose for your particular truck make and model year. Tubular-shaped nerf bars come in a variety of diameters, ranging typically from two- to six-inch round or oval step bars. 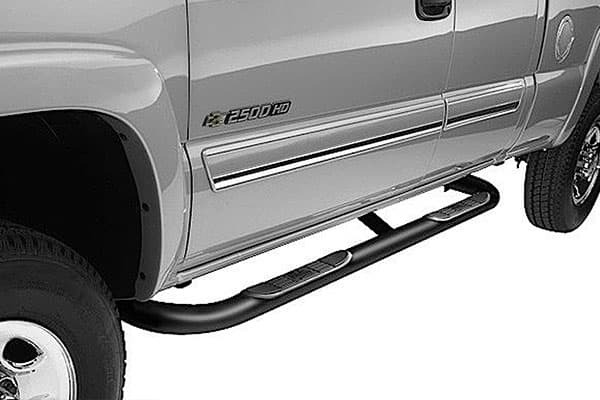 In terms of installation, both running boards and nerf bars come with brackets that secure it to the truck body, which means no drilling is not typically required. This is great because the vehicle’s warranty will not be voided due to any alterations being made to the truck’s structure. Nerf bars, steps, and running boards offer drivers similar function; they make it easier for you to get in and out of your truck. “Although all three have that one function in common, there are several differences that sets them apart. Trying to decide which one would be right for you and your vehicle can sometimes be difficult.” Real Truck, 2017. When making a decision, consider the cost, functionality, size and shape as well as the finish before committing to nerf bars or running boards.